A perfect guide for students and practitioners that is well written and filled with relevant advices on how to improve case-taking skills. 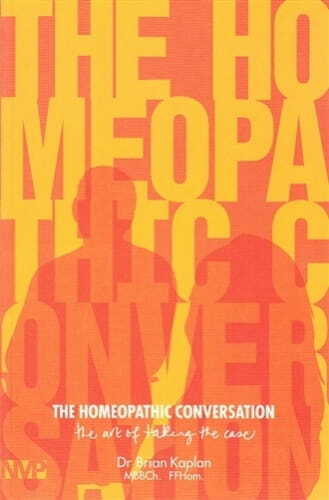 "It probably takes the better part of a lifetime to master the art of the homeopathic conversation. But there are some things in life that are worth waiting for…"
"Dr Brian Kaplan is a passionate teacher who builds on his insights from his clinical work and courageously and entertainingly shares his journey with all who listen. "– Dr David Owen, former president, Faculty of Homeopathy . This is the first book from Natural Medicine Press, and I am really pleased I bought it. In truth, it is rare that I read a work book from cover to cover. I took it on holiday along with some novels and (I know it's a cliche), "I could not put it down". Kaplan makes this book so personal that it really is a conversation. He writes the book in common language and it is packed with advice on how to improve case-taking skills. He's created a perfect guide for students and postgradu­ates. The chapters on taking the chronic case, receiving vital information and the use of techniques in the consulting room show Kaplan's approach to case taking. He openly shares his difficulties with us, discussing, for example, how to manage a situation where we inadver­tently do or say the wrong thing. His sincerity, warmth and love of homeopathy are apparent in the reading of the book. Even with all his training and experience, Kaplan's book is never conde­scending or intimidating to the new homeopath. Kaplan is medically trained, as well as being a homeopath. In the book, he uses the work of Buber, Reich, Jung, Freud, Rogers, Hal and Sidra Stone, and brings in the methods of other disciplines, such as NLP, in order to show their relevance to us as homeo­paths. I am always trying to encourage students when they sit in with me or study practitioner-development, to learn from counselling and psychotherapy techniques. It has made such a difference to the way I practice, especially with complex cases. Kaplan provides us with plenty of examples from his practice, and those of his students, where understanding the dynamics in the consulting room has benefited patients. He then also shows the reader how that might lead to better prescriptions. I loved the chapter on Carl Rogers and was also pleased to see a mention of Hal and Sidra Stone's, 'Voice Dialogue' technique, (see www.delos-inc.com). I have used Stone's work on dreams and inner voices and have linked it in with my prescrib­ing. This has been so successful with my patients over the years, that I value my studies with them as an essential part of my continu­ing professional development, easily as important as attending homeopathic seminars. I hope that this book will become recommended reading on the practitioner development courses as well as just a good read on case taking skills. Plus I look forward to more titles from Natural Medicine Press. Did you realise how important it is to provide the very best wooden hanger for your patients' coats? And you should offer to hang them up, in order to help make them feel welcome, and of course your best armchair. Brian Kaplan apologises that this conversation with the reader is of necessity a monologue. He writes like he talks, with enthusiasm, and you will soon forget that you do not have an opportu­nity to join in. It helps to have a paper and pen, or a keyboard and mouse there while you are reading, so that you may take the author's case as he spills out his innermost secrets with­out interruption. I suspect that he may need Phosphorus as at least on the surface he is so open and friendly, so concerned for your wel­fare, he talks so easily and without tiring, he is so sympathetic. The book is a demonstration model of its own art. Patients often ask what is the difference between homeopathy and psychotherapy, as we seem to ask about their innermost psychological secrets. The homeopath is a detective using the relationship and inter­view as a means of gathering information in order to arrive at a correct prescription. The psychotherapist uses the relationship between herself and the patient as a thera­peutic tool. Brian Kaplan goes one step further and shows how the relationship for a homeopath can become both, how to re­late well to the patient to obtain even bet­ter information, and for the patient to feel positive at the end. I became a homeopath partly to escape from the uncertainties and lack of clarity of the world of psychobabble. Kaplan uses psychological ideas to enhance our understanding of how we feel about our patients and ourselves, with minimal jargon. There are 21 Chapters, too many to list in the review. He begins by describing his career as a medical student and his escape into homeopathy. He tells of acute and chronic cases and of receiving vital information, receiving rather than interrogation being the correct term. He tells of the influences upon him, notable the German trained doctor, homeopath, naturopath, philosopher and psychotherapist, Dr Erich Ledermann. He tells of counseling and Carl Rogers, techniques in the consulting room, relating to children, to colleagues and more. This book is a revelation. It is exciting. There are no other books like this. There are a couple of essays by Pierre Schmidt on the art of interrogation and that is all. Af­ter reading this book not only will you have improved your case taking skills, you will have gained in enthusiasm and effec­tiveness as a homeopath, and even learned some more homeopathic philosophy. If you have a sick brother, you will wish to send him to Brian Kaplan or even go along yourself. Le Patron Mange Ici, as it says outside the best French restaurants.